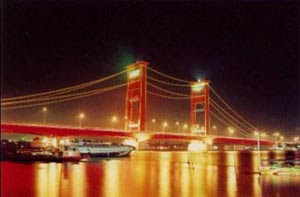 Musi river Palembang city split into two areas: Ilir across the north and across the southern part of the Ulu. Musi River, along with other rivers, form a delta near the city Sungsang. Water comes in the eye area Kepahiang, Bengkulu. Musi River estuary is a river of nine children, namely River Komering, Rawas, Batanghari, Leko, Lakitan, Kelingi, LEMATANG, Semangus, and Ogan. Land area of 3 million ha in the river (DAS) Musi often considered critical due to the occurrence of illegal logging. This condition can trigger large floods and landslides. Palembang is the climate of tropical climate region, with wind speeds ranging between 2.3 km / h - 4.5 km / hour. City temperature ranged between 23.4 - 31.7 degrees celsius. Rainfall/year ranges between 2000 mm - 3000 mm. The humidity ranged between 75 - 89% with the average - the average 45% solar radiation. Topography of land is relatively flat and low. Only a small area of the city where the land is located on a quite high on the north part of town. Most of the land is swampy areas so that at the time of the rainy season the area logged. Average altitude of 0 - 20 mdpl. In 2002 the minimum temperature occurred in Palembang City October 22.70 C, the highest 24.50 C in May, while the lowest maximum temperature of 30.40 C in the Month of January and the highest on the Moon Sepetember 34.30 C. Land plain water is not stagnant: 49%, Land stagnant seasonal: 15%, continue to stagnate Land: 37% and the number of rivers that are still functioning 60 units (from a previous 108) the remaining functions as the primary channel disposal. Relative humid tropics, between 220-320 Celsius Temperatures, Rainfall 22-428 mm / year, The ebb and flow between 3-5 meters, and height of land on average 12 meters above the sea surface. Soil type of Palembang layered alluvial, loamy and sandy, is located on the layer of the young, many contain petroleum, which is also known as the valley Palembang - Jambi. Land is relatively flat and low, the place is located slightly higher in the north of the city. Some of the city of Palembang water to be drowned again if there is rain again. • North; with Pangkalan Benteng Village, Gasing Village and Kenten Village, Subdistrict Talang Kelapa, District Banyuasin. Palembang is a resident branch of the Malay community, and using the Malay language has been tailored to the local dialect which is now known as English language Palembang as day-to-day, but the migrants often use the language as a regional language daily, such as language Komering, Rawas, Lahat, etc.. Immigrants from outside the South Sumatra also sometimes use the language as a regional language daily in the family or community in regional, such as migrants from Java and other areas in Indonesia. However, to communicate with other people of Palembang, residents generally use English as the language of Palembang daily. 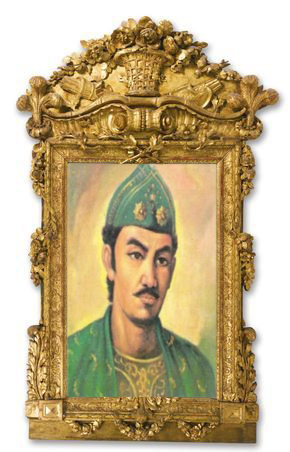 In addition to the original inhabitants of Palembang in Palembang residents there are also the descendants of immigrants and citizens, people such as migrants from Java, Madura, Kalimantan, Sulawesi (Makassar and Manado), Papua, Sumatra and the area of Other. The descendants of many citizens who live in Palembang is Chinese, Arabic and Indian. Majority religion in Palembang is Islam. In addition there is also a religious Catholic, Protestant, Hindu, Buddhist, and Konghucu.